Rock formations in the White Desert. Quartz-rich sand from the Western Desert near Sakkara, Egypt. Administratively the Western Desert is divided between various governorates; in the north and west, the Matrouh Governorate administers the area from the Mediterranean south to approx 27*40' N latitude, and the New Valley Governorate from there to the Sudan border, while in the east parts of the Western Desert lie in the Giza, Fayyum, Beni Suef, and Minya Governorates. The region is described by one writer as "a plateau standing on average some 500 feet above sea level, barren, rubble- and boulder-strewn, dark brown in colour, occasionally dotted with scrub, and, at first sight, flat". He also states that little of the area conforms to "the romantic view... the Hollywood scenery of wind-formed dunes with occasional oases fringed with palm"; those such areas do exist, in the Sand Sea where dunes are sculpted into fantastic shapes; the area is also the location of a series of oases created where the land dips sufficiently to meet the aquifer. These lie in an arc from Siwa in the north-west near the Libyan border, to Bahariya, Farafra, Dakhla, then Kharga in the south. East of Siwa lies the Qattara Depression, a low-lying area dotted with salt marsh and extending 190 miles west to east and 84 miles north to south. Further to the east, near the Nile, another depression gives rise to the Fayyum Oasis, a heavily populated area separate from the main Nile valley. To the south, beyond the Bahariya oasis lies the Black Desert, an area of black volcanic hills and dolerite deposits. Beyond this, north of Farafra, lies the White Desert, an area of wind-sculpted chalk rock formations, which give the area its name. To the south of Kharga the plateau rises towards the Gilf Kebir, an upland region lying astride the Egypt-Sudan border and home to pre-historic sites such as the Cave of Swimmers. In the south-west, near the point where the borders of Libya, Sudan and Egypt meet, is an area of desert glass, thought to have been formed by a meteorite strike at Kebira, over the border in Libya. The Great Sand Sea is a roughly lung-shaped area of sandy desert lying astride the border with Libya, 200 miles inland from the Mediterranean. The sea is divided by a long peninsula of rocky desert along the border, leaving the eastern lobe in Egypt and the western in Libya, where it is called the Calanshio desert. On the Egyptian side it extends from a point south of Siwa for 400 miles into the interior, to a point north of the Jebel Uweinat. The Western Desert was known historically as the "Libyan Desert", taking its name from Ancient Libya, which lay between the Nile and Cyrenaica. With the formation of the state of Libya, the term "Western Desert" has come to describe that part of the Sahara in Egypt. To the Ancient Greeks, the term Libya described the whole Saharan littoral west of the Nile to the Atlas mountains. During Roman times the term Libya was limited to Cyrenaica and the region between there and Egypt, which were organized as the provinces of Libya Superior and Libya Inferior. The term Libyan Desert then applied to the area to the south of these. This became a misnomer during colonial times when Cyrenaica and the land to the west was organized as the Italian colony of Libya in 1911, and the term Western Desert to describe the area within Egypt became more common. Playfair described the Western Desert of 1940 as being 240 miles wide (i.e. from the Nile to the Libyan border) and 150 miles wide (i.e. from the Mediterranean to the latitude of Siwa oasis), while the region to the south was referred to as the Inner Desert. However, during the Second World War the term Western Desert came to apply not only to the coastal desert of Egypt but to the area fought over in Libya also, ranging beyond the Egypt-Libya border to Gazala, Cyrenaica and even El Agheila. The contemporary use of the term refers to the entire desert in Egypt west of the Nile. In pre-historic times the Western desert is thought to have been a semi-arid grassland, home to savannah animals and hunter-gatherers; evidence of abundant wildlife and surface water can be found in the cave paintings of the Gilf Kebir. It is thought over-grazing and climate change led to desertification and the current geography. Even after this, the oases remained inhabited, and the Antiquities Museum at Kharga has artifacts dating back to the time before the early Egyptian kingdoms. In ancient times the area was regarded as being under the jurisdiction of the kingdom of Egypt, and Egyptian remains can be seen in all the oases. In 636 BC an expedition by the Persian king Cambyses II was lost in the desert searching for the Oracle of Ammon, at Siwa. In 333 the Oracle of Ammon was visited by Alexander the Great, where he was confirmed as the son of Amun. With the absorption of the kingdom of Egypt into the Roman Empire the desert region was organized into the province of Libya Inferior, while Cyrenaica became Libya Superior. In time the region came under the jurisdiction of the Byzantines, their successors, the Arabs, Mamluks and Turks. In 1882 the kingdom of Egypt became a British protectorate, and in 1912 the territory to the east was claimed by Italy as the colony of Libya. In the 20th century the Western Desert became an arena of conflict; during the First World War it was the location of the Senussi Campaign against the British and Italians. The 1930s saw an upsurge of exploration and mapping expeditions by British Army officers, such as Ralph Bagnold and Pat Clayton, laying the basis for war-time operations by such forces as the Long Range Desert Group. This period was also marked by the search for Zerzura, a mythical oasis in the deep desert. 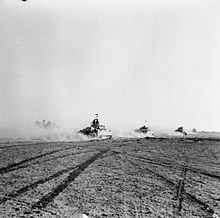 During the Second World War, from June 1940 until November 1942 it was the location of the Western Desert Campaign fought between the Axis powers (Italy and Germany) and the Western Allies (principally Britain, and the Commonwealth, a total of 15 nations) until the Allied victory in November 1942. In modern times the Egyptian government has been keen to develop the area economically, encouraging settlement of the oasis areas, and surveying for mineral wealth, particularly oil. ^ Fouad N. Ibrahim; Barbara Ibrahim (5 December 2003). Egypt: An Economic Geography. I.B.Tauris. pp. 57–. ISBN 978-1-86064-548-8. Wikimedia Commons has media related to Western desert (Egypt).